Students will read a wide variety of poems and look at the techniques that poets use including poetic devices such as metaphor, verbs, similes, apostrophes, stanza length, powerful language, and how poets engage the readers’ senses. Students will write their own poems, they will hear poems read, and they will gain awareness of what makes effective delivery. Students will complete three polished writing assignments in this unit, search for inspiring poetry performances online, and make a video of their own spoken poetry. In this unit students will read Shakespeare's Julius Caesar, exploring the eternally relevant themes of militarism, personal conflict, ambition, and pride. Assignments include one that deals with imagery in the play, a speaking assignment giving advice to the characters, an assignment about irony, and a unit culminating essay. Students are invited to read widely and explore the varied selection of stories provided. Three writing assignments will be completed on the stories chosen. Students will read William Bell's novel, Stones. In doing so, they will explore themes such as gender inequality, racism, local history, and maturation. Students will also produce several pieces of writing, one of which is a formal essay in which they will provide quotations from the text, properly cited in the body of the essay as well as at the end in a Works Cited page. Stones, a novel by William Bell, should be available as a used text in bookstores or in public libraries in the Young Adult (YA) section. English 2D acquaints students with a full version of a Shakespearean play as well as with a Canadian novel, both of which deal with themes that have to do with power and human error. With such themes in mind, students write their first formal essays on literature, analyse selected poems and short stories, and create their own oral presentations on topics approved by their teachers. 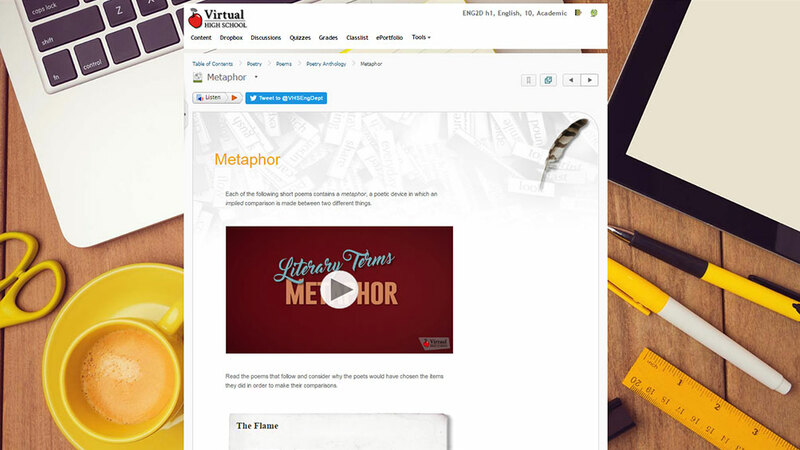 VHS online demonstrations and videos pertaining to poetic devices enable students to proceed with work on the poetry unit. Analysis of poetic styles are conducted through a variety of subjects. A pdf on Shakespeareâ€™s Julius Caesar is accompanied with animation that allows students to deal with Elizabethan English and the playâ€™s concepts. Scaffolding at various stages in the study of the play gives students practice in writing about Shakespeareâ€™s plays. Pdfs of short stories focus on the elements of fiction. Reflecting on and writing about diverse media and various genres allows students to develop their unique insights into literature.